Posted on December 16, 2013	by Smiling Road Warriors! A spirited young waiter, wanting very much to show off his skills with the English language, recommended what we should order and proceeded to lavishly demonstrate the process for us. It was delightful. The Pho 24 chain is what we would consider a fast food chain here in Vietnam, primarily for Pho — similar to Baja-Fresh back home for fresh and good quality Mexican in Portland. Delicious. 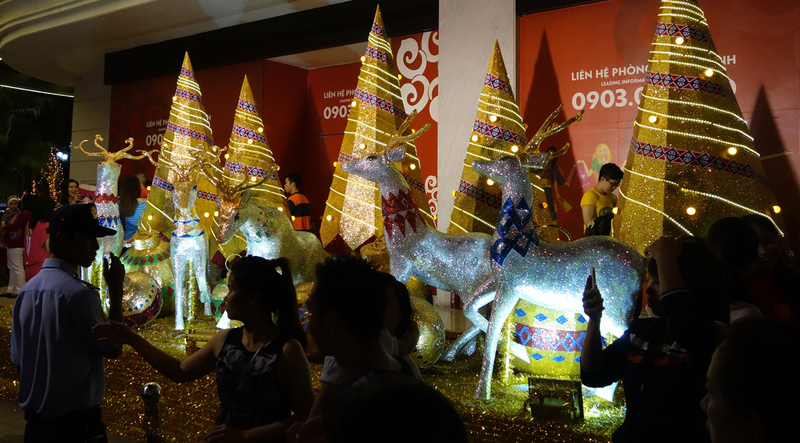 One of our biggest surprises in Vietnam to date has been the elaborate Christmas decorations, seen everywhere, and how the Vietnamese celebrate this ‘Christian’ Holiday. Being largely a Buddhist country, it was unexpected. Although, 7 to 8% of the country do consider themselves Catholics. 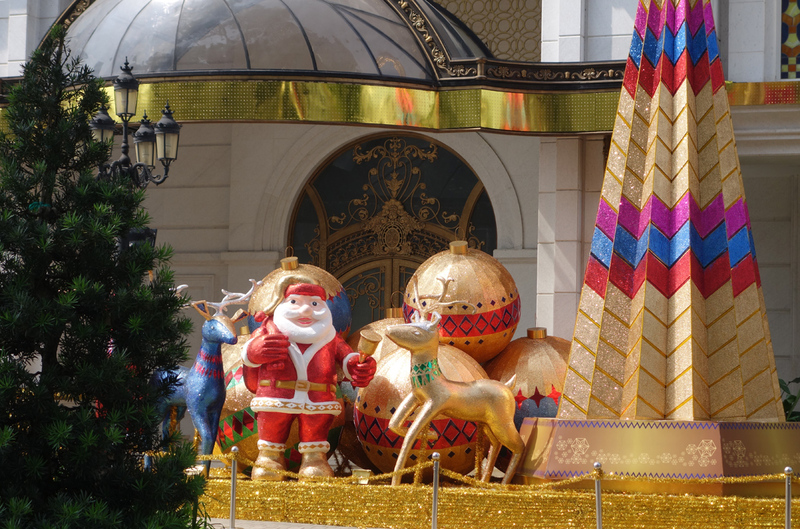 We walked through massive crowds of people taking pictures in front of all the decorations and store windows. So o o o – we got in on the act, and everyone started taking pictures of US in front of the stores and windows! 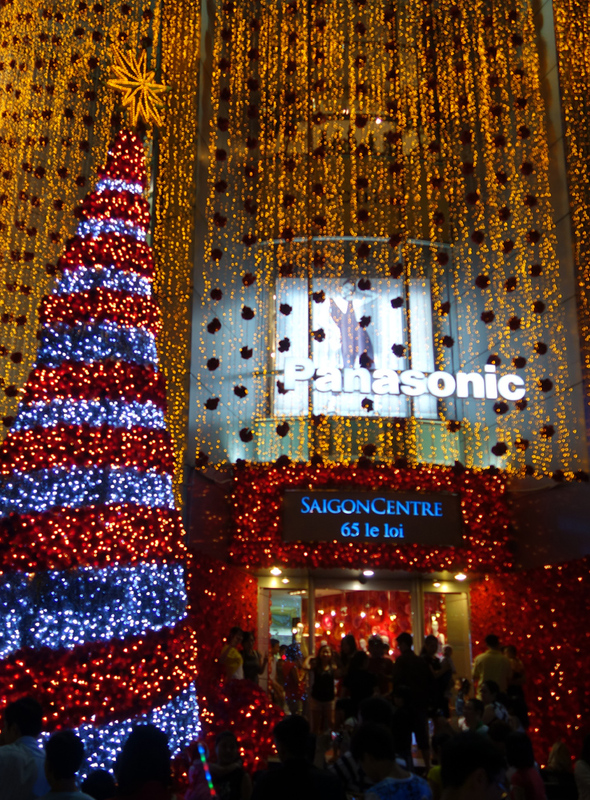 We understand that it has only been in the last ten years that the Vietnamese began to actively celebrate both Halloween and Christmas. As our Vietnamese guide and friend explained, they just love to party, and these celebrations are good ones for that here in S.E. Asia. Have to admit, never heard one single song that echoed a Christian religious sentiment . . . The traffic here is unbelievable. That’s probably all I need to say. We thought it was chaos in Phnom Penh, but in Saigon, with over 8 million people in the central city, most of whom travel by motorcycle/scooter, it was even more frightening (at first) to cross the streets. One learns, and quickly, that the drivers of cars, motorcycles, bicycles and trucks are very aware of each other and you — so you just walk at a slow, reasonable pace across the street and traffic finds its way around you. I would never trust USA drivers to be so considerate. We have now gotten used to this Asian way of negotiating traffic, and are amazed at how well it works! Neither of us can recall seeing even ONE accident on any of the streets thus far. 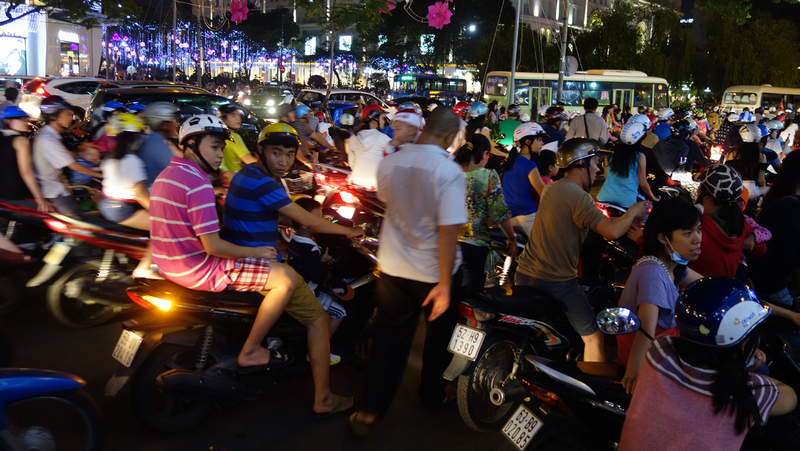 But, can’t imagine what traffic will be like as Vietnam grows a larger middle class that can afford more and more cars. Witness Beijing . . . 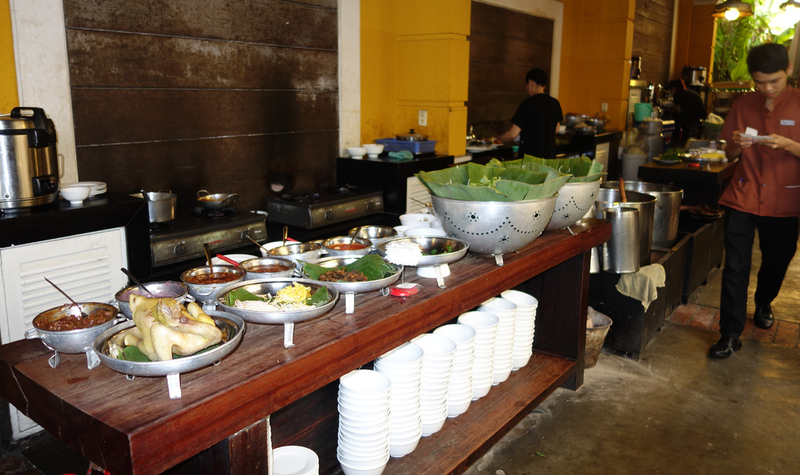 This is a great place to get street food, but in a very hygienic setting. It was such great fun walking around these stalls and then deciding what to order from the over 25+ stations. If Only we could have eaten more–it all looked so good. 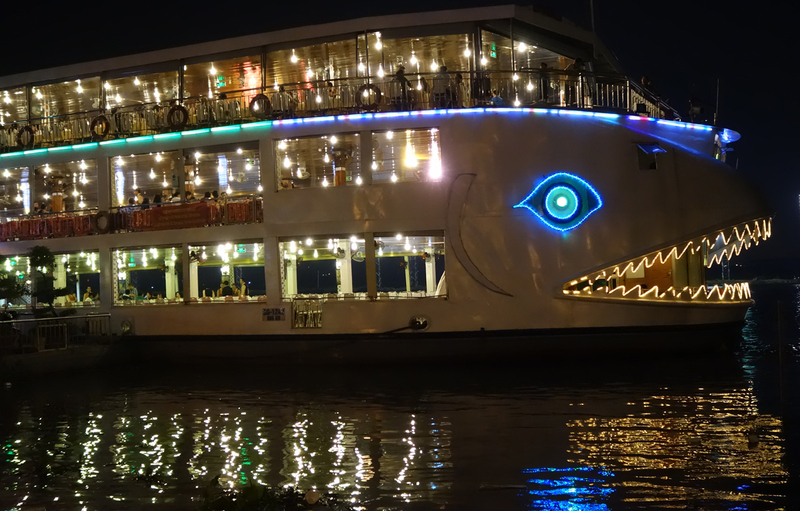 Vietnamese food is so healthy: with fresh fish, seafood, oodles of herbs, so many kinds of mint and special chili sauces that make the favors give one’s palate a variety of sensations and favors – – it’s all divine. 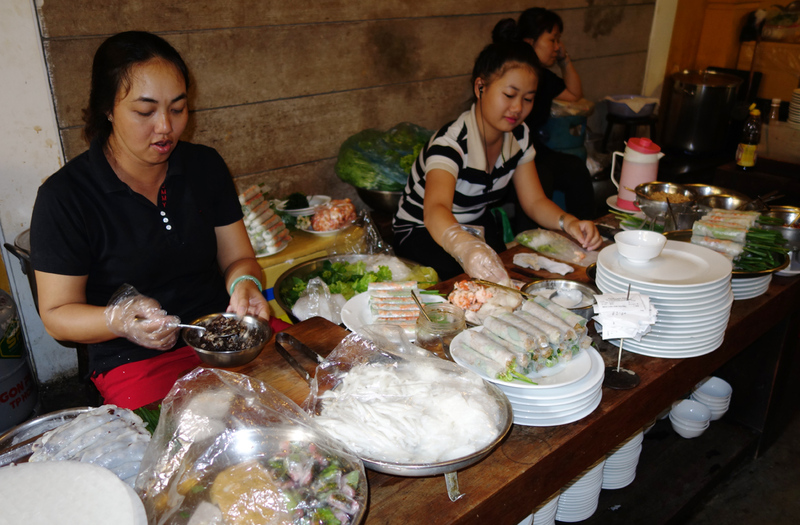 We are truly eating our way through Vietnam! 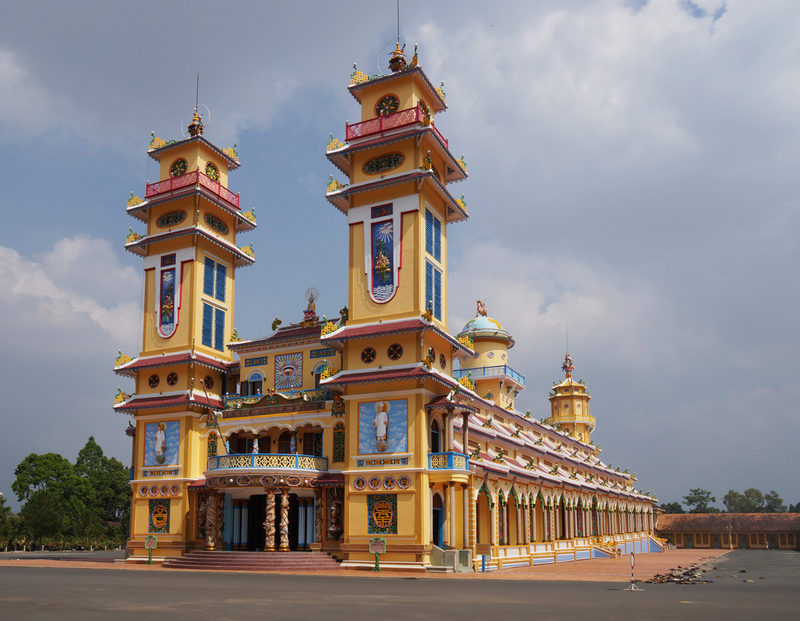 The next day we travelled north of Saigon to see a number of sites, the most unusual of which (for us) was a visit to a Cao Đài Temple complex. 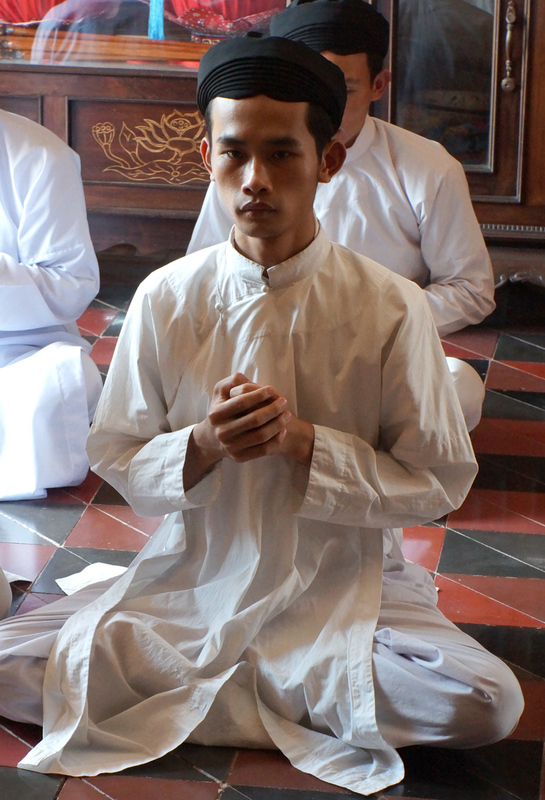 Cao Đài is a fairly modern religion established in the city of Tay Ninh in southern Vietnam in the mid 1920’s. 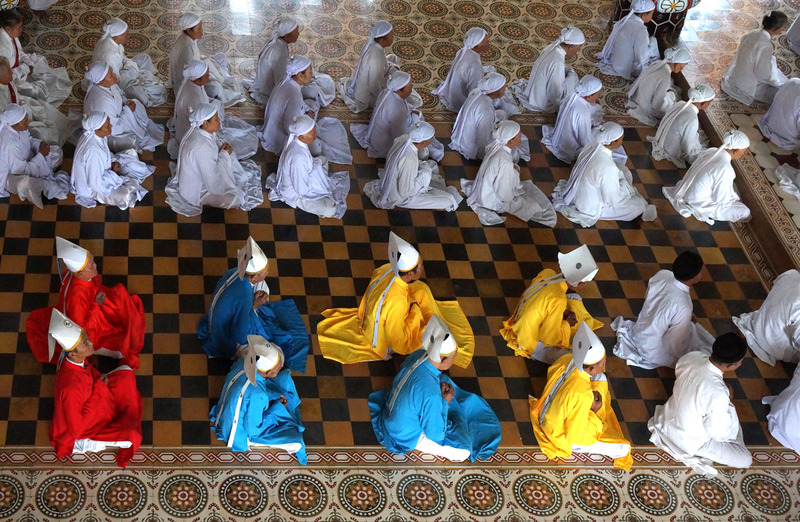 90% of its followers live here in south Vietnam. 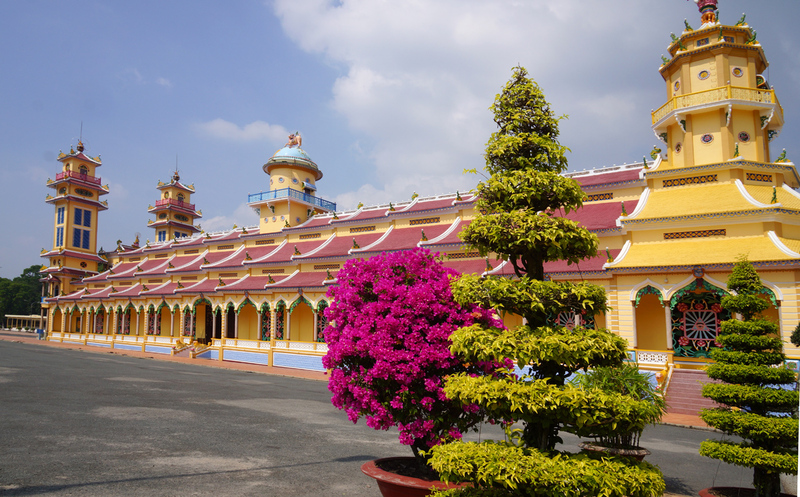 After the Vietnam war all of its property was confiscated by the communist regime, as the group had been politically active in opposing the war. Their land was returned to them as recently as 1985. 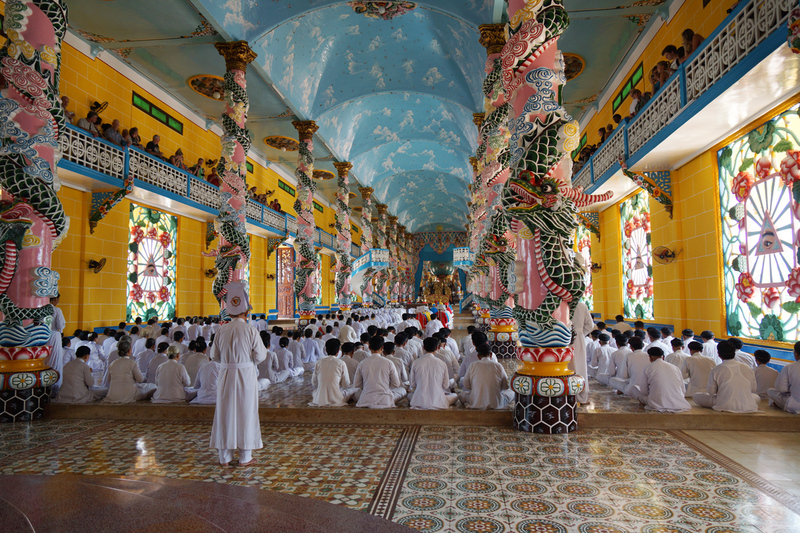 Cao Đài (also known as CaoĐàism or Dao Cao Dai) is a modern, Vietnamese religious tradition with strong nationalistic elements. The term literally means “Kingdom of Heaven.” Figuratively, it is referred to as that ‘highest place where God reigns’. Graham Greene, in his classic , The Quiet American (which we both read again before we crossed the Pond), described Cao Đài as “Christ and Buddha looking down from the roof of a Cathedral on a Walt Disney fantasia of the East, dragons and snakes in technicolor.” Couldn’t have said it any better myself! The effort of Cao Đài as I understand it, is to “unite all of humanity through a common vision of the Supreme Being”, whatever the minor differences, to promote world peace and understanding. It doesn’t seem to want to create a universal or pantheistic belief where all religions are the same, only to create a more tolerant place for people to live, where everyone can see each other as equals searching for peace within and without. Not a bad philosophy . . . I think they’ve got ’em ALL in there! Gary enlisted as part of the Temple grounds maintenance crew! 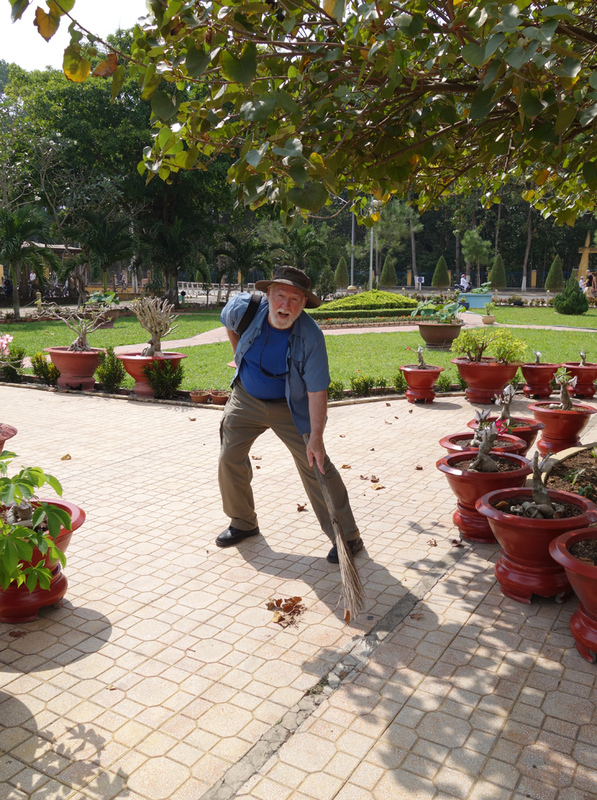 These brooms are used all over Vietnam to keep the streets and store fronts clean — hard on one’s back. . .